Line the springform with parchment paper and PRE-HEAT the oven to 170 degrees celsius or 340 degrees fahrenheit. FILL the pan with a layer of water and bring to a boil to create the bain marie. ADD 2 eggs to the bowl and place on top of the pan. Start to whisk and gradually add the sugar (40 gram). WHIP the eggs until bubbles appear and the eggs are lukewarm. USE a standmixer or handmixer to mix until the eggs become light in color and thick in texture. Gradually SIFT in the flour and matcha and carefully fold it with a spatula to not lose the fluffy texture. ADD milk and butter in a small saucepan and heat it up on low heat until the butter melts. ADD a small amount of the egg and flour mixture to the small saucepan and combine well. Now ADD the content from the saucepan to the egg mixture and again carefully combine to keep the fluffy texture. POUR the batter into the prepared springform and bake in the oven for about 15 minutes. Use a wooden toothpick to check if it’s done, when the toothpick comes out clean, the cake is ready. DROP the cake from about 20 cm to prevent it from becoming flat. 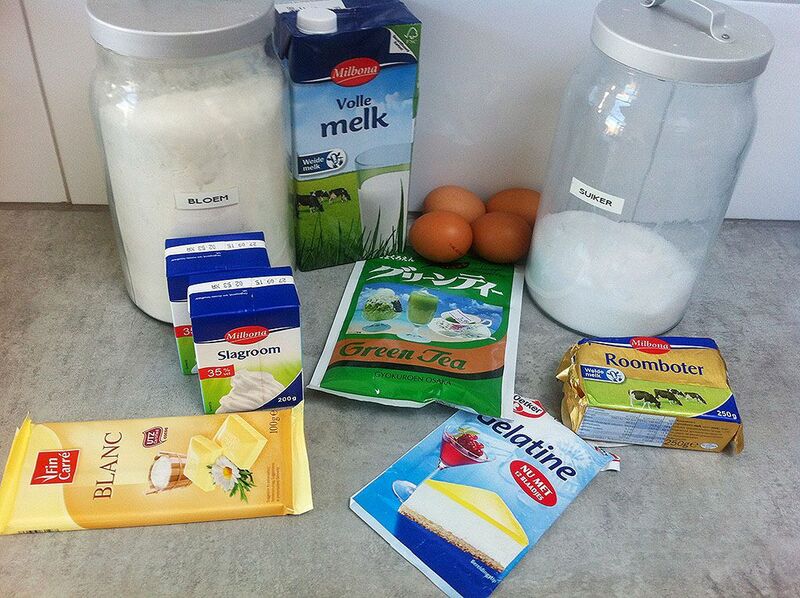 Now it’s time to make 2 kinds of mousse, one with white chocolate and one with matcha. Whip all of the cream (250 ml) until it’s still quite soft and creamy. Set 100 ml aside in the fridge to create the matcha mousse later on. SOAK two of the gelatin leaves in cold water. HEAT the milk (50 ml) in a small saucepan. When the milk is hot, but not too hot, turn down the heat and whisk in the white chocolate. DISSOLVE the gelatin into the white chocolate mixture and wait a few minutes until it’s lukewarm so the mousse won’t curdle, separating the liquid and solids. Combine the cream and chocolate mixture well. WHIP the egg whites until they form stiff peaks. Carefully fold the egg whites into the chocolate mixture using a spatula. POUR the mousse on top of the cake and set in the fridge to become firm. 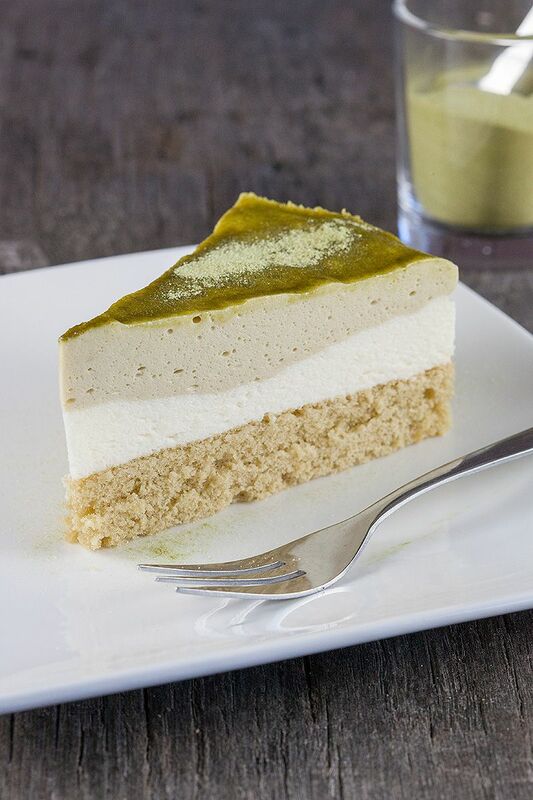 Meanwhile create the third layer, the matcha mousse. ADD the egg yolks and sugar in the bowl of your standmixer and mix until the egg become white and fluffy. SOAK the other 2 gelatin leaves in cold water. HEAT 3 tablespoons of water in the small saucepan and stir in the matcha powder. ADD the milk and when it’s warmed up, DISSOLVE the gelatin leaves into the hot mix. Keep on mixing the egg yolks and gradually pour in the milk mixture. Let the mix cool off slightly. 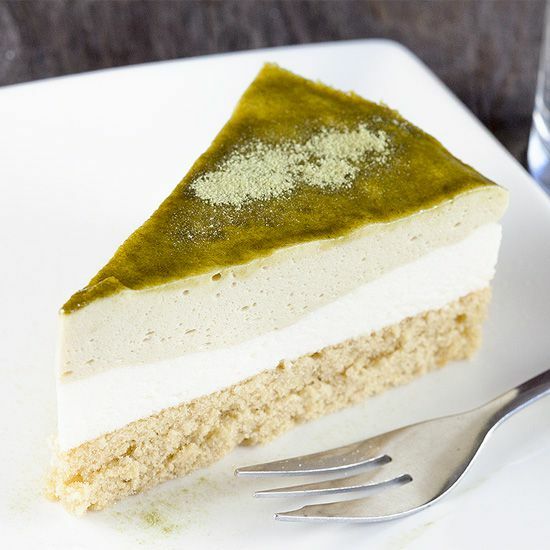 COMBINE the 100 ml whipped cream from the fridge with the green tea mixture and that’s it. Now POUR it onto the white chocolate mousse to create the third layer of the pie. Set in the fridge until the pie becomes firm, that will take about 2 hours. 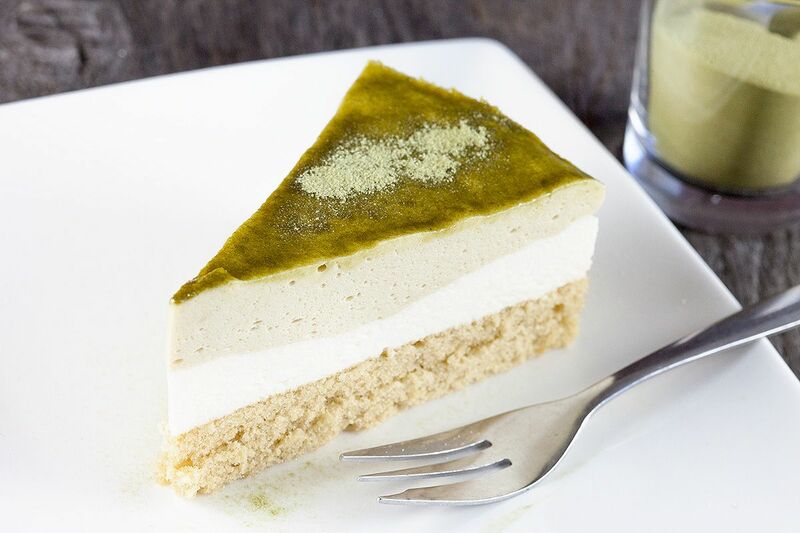 SIFT with more matcha powder as decoration and enjoy!